The Blues Are Back in Town: Out Now! Have to say, the launches were a bit disappointing, but with them out of the way, I’ve been getting down to the business of doing some promo work. The book has thus far been featured in the WM section of the Western Mail – a nice two page spread. I’ve had some help dishing out flyers around Cardiff from my mate, DJ Mod. This is a picture of us at the Leeds game on November 3rd. Note the blue dot of light on my forehead that looks as if a Leeds fan has a sniper trained straight at me (with a blue laser instead of the more common red). Hoping to get it in HMV soon. It’s also on sale online from Amazon, and the Parthian website (signed copies from here). 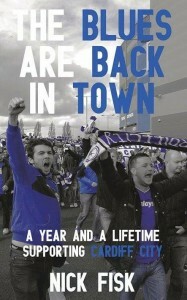 This week, we’re hoping the Echo will finally run a feature on the book. 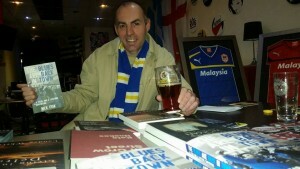 There was the hope that the Cardiff City club shop would stock the book and I would do a signing there, but things have gone a little quiet on that front. If that doesn’t happen, hopefully I might at least sign some books at the Supporters Club Shop. The exciting news just in is that I should be appearing on Cardiff’s very own TV channel soon. We’ve got a facebook page up and running: www.facebook.com/thebluesarebackintown which I’ve had some help with from Mod as an additional moderator! Have had a couple of nice reviews on Amazon from Mr Topher Mills and Mr Tim Brenan. Anyone who’d like to contact me about the book, or anything else, please click the contact link which will give you my email address. Cheers!